Coach Jonathan Humphreys has revealed the Ospreys have no money to recruit players to bolster their squad in the summer. Ospreys, who are the reigning Pro12 champions, are the most successful side in the tournament, having won the title a record four times. 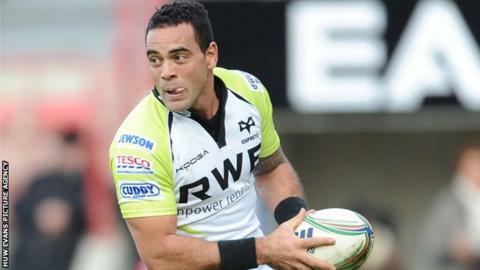 But the Ospreys forwards coach says they have no funds to spend on bringing in new players. "We would love to spend in the summer but there is no money," said Humphreys. "There is no money at all for us and that comes from factors like having the least funding of anybody. "Therefore, there is no money left to go and strengthen." Ospreys have seen a batch of players fly the nest over the last few seasons, with Samoan scrum-half Kahn Fotuali'i the latest to leave in the summer to join Northampton Saints. The 30-year-old, who has made 39 regional appearances in two years at the Liberty Stadium, is out of contract at the end of this season. New Zealand-born Fotuali'i, who has won 13 caps for Samoa, was part of the Ospreys side that won last season's RaboDirect Pro12. He joined the Welsh region from Super Rugby outfit Crusaders, for whom he played 28 times, and has also appeared at fly-half. Ospreys have lost a host of internationals over the last few seasons, with prop Paul James, wings Tommy Bowe and Nikki Walker, fly-half James Hook, scrum-half Mike Phillips, full-back Lee Byrne, flankers Jerry Collins and Marty Holah all leaving the Liberty Stadium. Humphreys hit out at the "unrealistic" expectations of Welsh success in the Heineken Cup after the Ospreys' exit from the tournament in the knockout stages, earlier this season. He admits the prospect of not being able to strengthen the Ospreys squad is frustrating but he is more concerned about falling further behind their rivals in the Pro12 and the Heineken Cup. "Of course it's frustrating, especially when you are judged on what you win and how you go in the major competitions and everybody in that competition has more money than you to strengthen their squad," said Humphreys. "Look at Glasgow, they have gone on a hell of a run purely on the strength of their squad. It is huge. "Leinster will be the same. Munster next year will have the ability to go and get more players. Everybody is going to get stronger." Humphreys admits losing international players to Wales duty during the autumn Tests and Six Nations has become an issue for the Ospreys. The former Wales skipper recommends the radical step of moving the Six Nations, in particular, to the end of the season. "If it stays as the format (the season) that we fund international rugby players and some of them we get for less than 10 games a season, even though we are paying their wages, I think it makes sense it is at the end of the season. "We need these players playing for us and there is a huge amount of rugby played when these boys are away. It doesn't make sense." Hore frustrated by player drain. Read more on Ospreys chief Andrew Hore frustrated by Wales' player drain.